Visit any heavily populated inner city middle or high school in the U.S. and the hallways are literally a gallery of rich artistic creativity seen in the form of intricate designs etched into little boys' heads. In local colleges in India, this form of creativity has been adopted by the young men seeking a higher education, according to The Times of India. "I am a die-hard football fan and am sure this tattoo is going to catch a lot of attention," says LNCT College student Mohit Jupkar, who paid 350 rupees for his design (which is about $5.37 in U.S. dollars). The term 'tattoo' is being used to depict the unique etched-in hairstyles. And salon owners are excited about this trend, as it has boomed their business and clientele within the college communities. Salon owner Ravi Sharma recalls another popular request from his new client base. 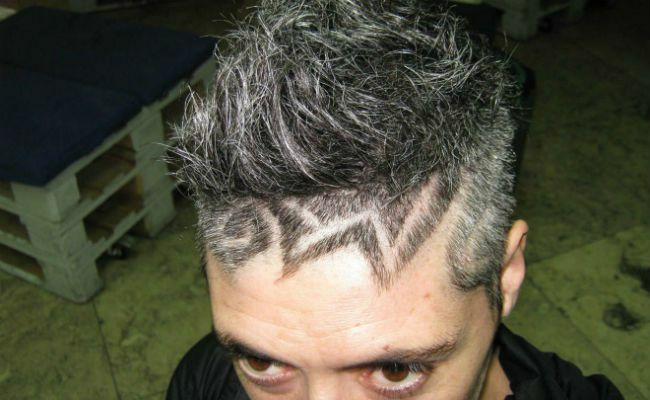 "While some people get their initials tattoos as their hairstyles, other[s] chose designs. Hair tattooing requires a lot of finishing in case one does not want to go completely bald to bring out the tattoo." An animation student from Maya Academy, Veer Lodhi, is one of many who wants something creative and unique to his own personal style. "As I follow WWE very closely, I got a WWE initial hair tattoo a few days back. Earlier, I was planning to get a wrestler's face but did not opt for it as I did not want to lose too much [hair, which happens]...when getting a big tattoo." Even traditionally conservative schools like Naveen Arts and Commerce College and BSSS College, both in Bhopal, are emerging outside of their usual dress code to try something that is deemed new and "hip" according to local barbers. "These days, youngsters don't shy away from experimenting with their hair and trying newer hairstyles," says salon owner Sunil Sharma. The undercut is another popular request that student Rahul Sen's friends have been sporting lately. "I too went for [the undercut]. I paid Rs 800 for this hairstyle, with Rs 350 for the haircut and Rs 450 for the colouring." In America, these type of haircuts can cost an upward of $100, which would be about $6511 rupees, so the value and room for true creative expression is there. While you can go to pretty much any barber in a traditionally culturally diverse neighborhood and make the same request for your son, these young conservatives in India are indulging in the newfound freedom of rocking a one of a kind hairstyle that can display their own hobbies and interests outside of school. What happens to those who can't hang with their new 'tattooed hairstyle'? They can shave off and start brand new, of course. Naveen College student Vikram Thakur will do what he has to in order to create a new canvas for new hair art. "I do not mind shaving off my hair as it will grow back soon enough."